Come explore Historic Spanish Point in the moonlight! Every month on the Friday closest to the full moon, we will have our Full Moon Walking Ghost Tour. 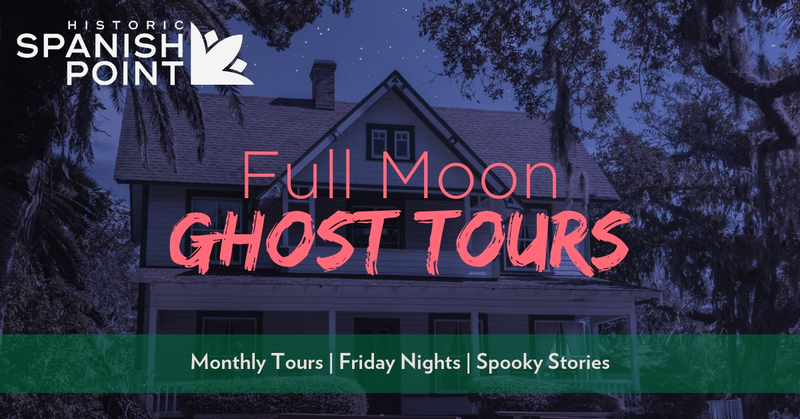 This unique storytelling tour will take you on a walk among historic houses, prehistoric mounds, and our pioneer cemetery while you hear the ghost stories and tales of mystery about Sarasota and Florida that you will not hear during our daylight tours! All tours are $20 per person. There will be two or three tours an evening. The tours will meet at the white Gazebo on the Historic Spanish Point site and each tour will last approximately 90 minutes and will be roughly a ¾ of a mile walk outdoors with some pathways up and down stairs. In the event that the tour is canceled due to severe weather conditions, then it will be rescheduled for the following Friday. For questions, or assistance with registration, please call our front desk at (941) 966-5214 x 0.